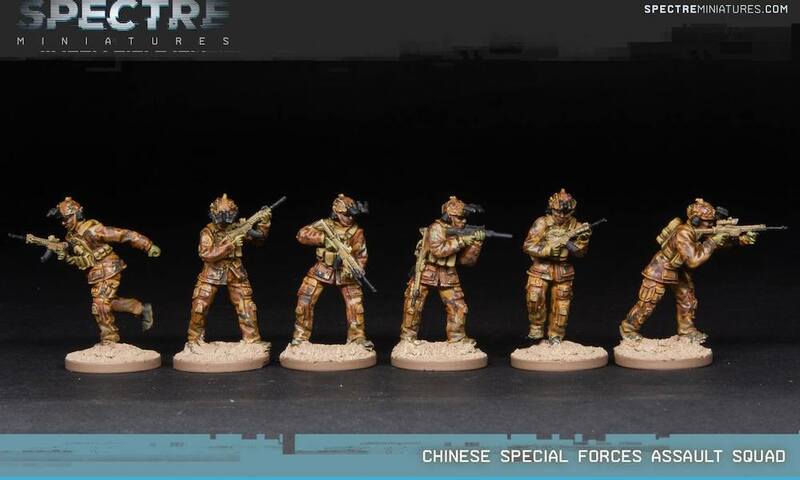 Spectre Miniatures veröffentlicht neue Chinese Special Forces. They carry Chinese SCAR family NAR-739 battle rifles, which fire the common 7.62×39 AK-47 ammunition for ease of supply and anonymity. The squad marksman carries the NAR-751, which fires the more powerful NATO cartridge for greater accuracy and stopping power at range. 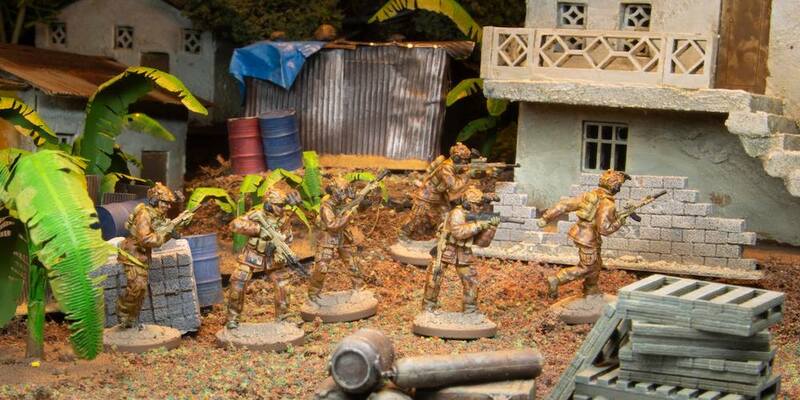 The weapons are fitted with a variety of CQB and battle sights, as well as lights and lasers. Backup pistols are carried in some cases, others opting for a couple of extra mags for their rifles. 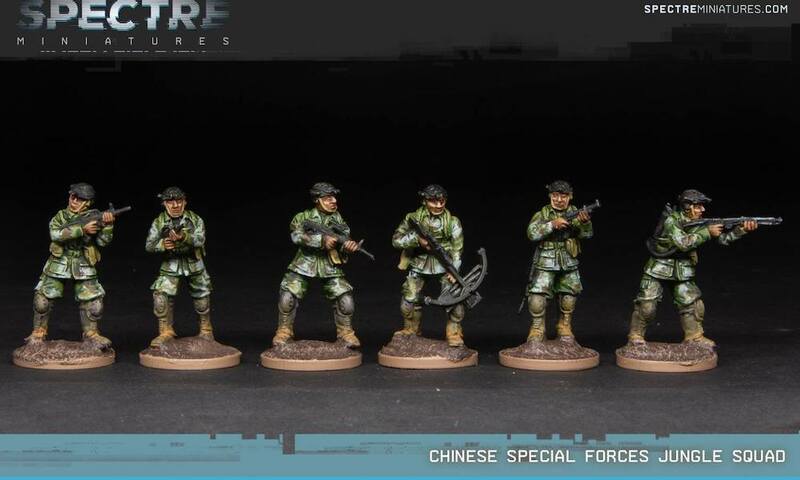 This Chinese Special Forces Jungle Squad have a mixture of standard and specialised weapons for jungle combat, according with the more interesting Chinese way of waging warfare. 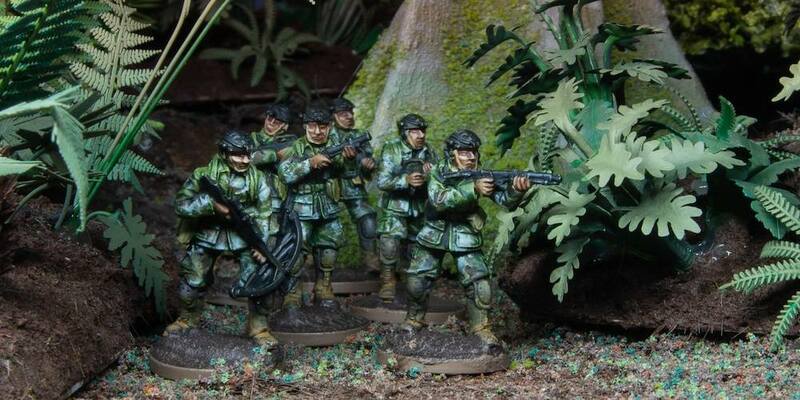 The riflemen in the squad carry standard-issue Chinese bullpup QBZ95 assault rifles – a short overall package and good for the confines of the jungle. One grenadier carries a copy of a US M79 ‘blooper’, that can be loaded with smoke and high explosive rounds, as well as more specialist buckshot and flechette ammo for devastating short-range use in the jungle. Squad specialists include more exotic weapons – one man carries a Type 74 flamethrower, very effective for clearing trenches, caves and bunkers and one man a hunting crossbow for quiet killing of sentries and guards. They wear lightweight vented bump helmets to keep cool and comfortably mount night vision equipment and wear jungle clothing. They have spare ammo, grenades, communications and survival gear in belt rigs and small backpacks for easy movement through foliage. Despite being a ‘jungle squad’, this loadout would be an extremely effective setup for any CQB environment – particularly urban terrain where the squad weapons mix and flamethrower would be a force to be reckoned with in games of Spectre: Operations. Ersten Modelle von Spectre die mir nicht so zusagen.